Warm greetings from our Highlands studio, where weeks, months and a whole season have come and gone as we work away from morning 'til night. Recently our garden was filled with snowdrifts taller than Paul, who spent each day shovelling a way through from the cottage to our studio. We were completely oblivious to the fact that our peninsular was cut-off from the outside world, until friends from England rang to enquire about our well-being. Thankfully we usually have a well-stocked larder and log stores for the wood-burning stove in the studio. Such is the life of creatives, totally absorbed with a project that has been many years in the making. 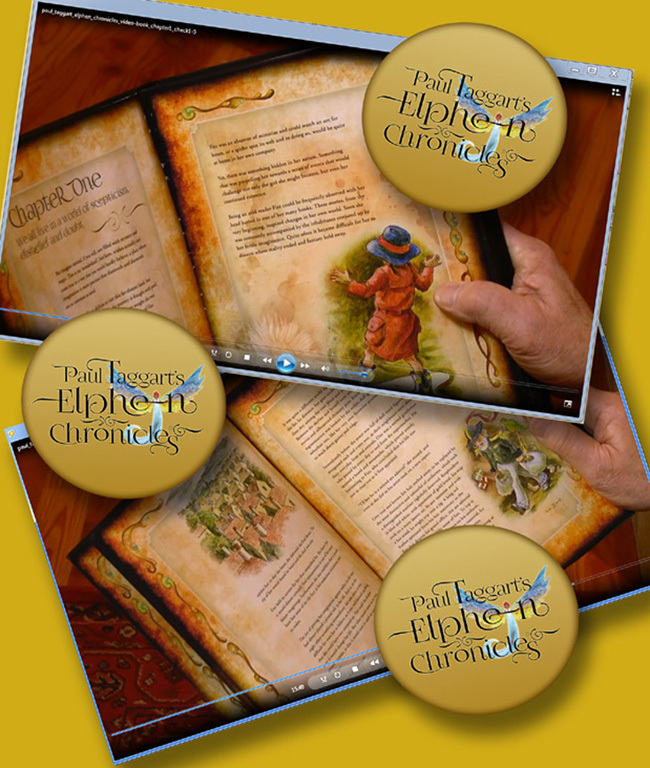 Please accept our apologies for not being in touch, but we know you will understand when we say that Paul Taggart's Elphen Chronicles has taken on a life of its own and we need to run with it, since so many years of our lives is invested in it. That is not to say that we are giving up on Paul's tutorials - we are not, of that we can reassure everyone - more on those in the coming weeks. T he Artist’s Legacy First Edition of Paul’s upcoming book ‘Webstrand, the Tooth Gatherer’, the second book in Paul Taggart’s Elphen Chronicles, is well on the way, as our Partner/Design Director Sunita Gahir gets it ready for the printing presses; a stunning example of book design, as exemplified by Sunita’s creative excellence. Meanwhile, we’ve also started work on another, rather special, version, one that can be accessed online – our Artist’s First Edition Video-Book. 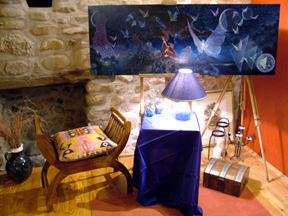 First, we set aside our story-telling corner in the studio, featuring the completed large Masterworks oil painting, which is destined to be the book jacket for the printed version. 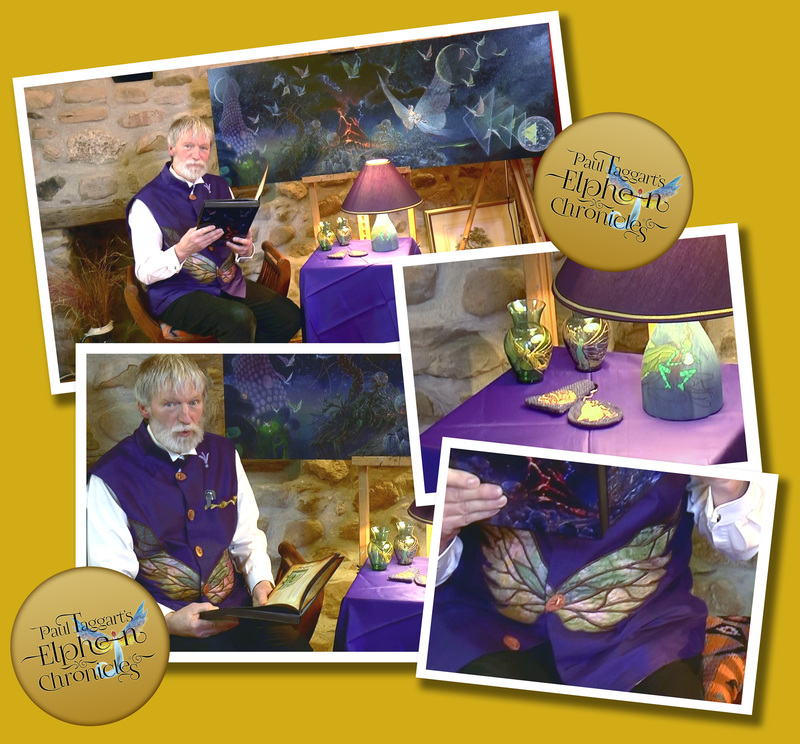 As you can see, the story-telling seat did not stay empty for long, as Paul took his place for the first read-through of Chapter One for Eileen to film and record. Several days later and all was completed on the read-through, then it was over to Eileen to make and produce the video for Chapter One, which does not simply feature Paul reading through the pages in Chapter One – there is more to it than that – much more, including the Elphen Soundscape on which our Collaborator/Music Director Liza Mulholland has been working for some considerable time - click on this link for a FREE-TO-VIEW Bonus Feature peek into the first stages of preparations for the Elphen Soundscape..
What do you reckon to Paul’s snazzy waistcoat, an original design, created and produced by Ruth Black Textile Artist? Check-out those fabulous shimmering Elphen wings, which are constantly changing colour as Paul moves under different light conditions - an amazing technique that Ruth developed especially for this waistcoat. Spotted the embroidered pocket border? What about the five hand-made buttons (each featuring a significant Elphen rune? The Three Quills emblem is an exquisite example of Ruth Black's skill with embroidery, as are the 'kissing Elphen' on the reverse of the waistcoat (must get a photo for that to share!!) More on the embroidered items resting on the table, so watch this space, as they say! Want to know more about Paul's Elphen waistcoat - simply click on this link and you get to watch our FREE-TO-VIEW Bonus Feature video, a behind-the-scenes peek into the making of the waistcoat. Chapter One for the video-book is now completed and works starts in the coming days on Chapter Two. 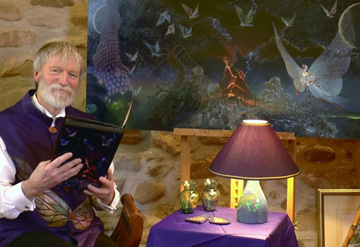 There are nine chapters in this highly illustrated book, featuring over 110 vignettes produced using Paul’s unique oil painting technique; all centred around a collection of nineteen large, small and miniature Masterworks oil paintings. We’re having an absolute ball, made even more exciting by the creative input of our wonderful hand-picked Elphen team, as is evident from the ever-growing series of FREE-TO-VIEW Bonus Feature Films that we’re releasing as this project heads towards its launch date. For we have also been ‘chronicling’ the work of those involved, by filming behind-the-scenes videos, in which we are all delighted to share the various processes that go into making such a diverse project – all those released thus far can be accessed directly from one of our channels on Paul’s official Vimeo account – where you can not only watch the Bonus Features free-to-view, but also the many trailers relating to the ever-growing Chapter Story Vignettes series and the Masterworks series where you will see that we’re now up to Chapter 5 of the former and Episode 20 of the latter simply click on this link and all will be revealed. 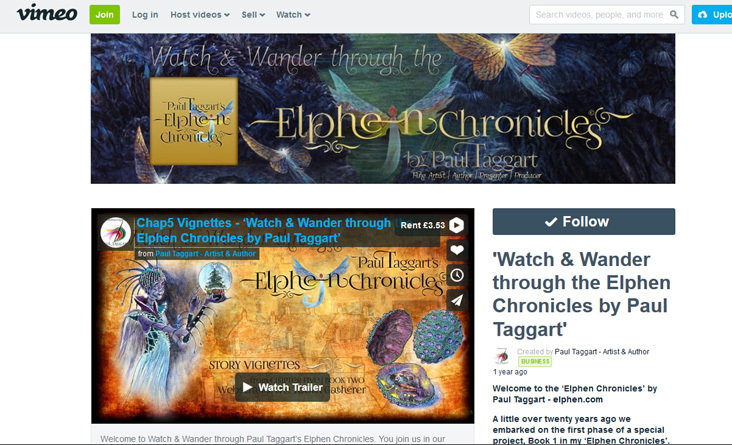 Paul Taggart's Elphen Chronicles 'storytelling' Artist’s First Edition video-book will ultimately comprise of nine videos in the box-set, one for each of the nine-chapters that make up the Artist’s Legacy Edition printed book of 'Webstrand, the Tooth Gatherer'. Featuring our Partner/Design Director Sunita Gahir's glorious designs for the book, along with Paul's reading and exclusive oil paintings, plus more besides; all of which is accompanied by the Elphen Soundscape, exclusively composed and performed by Liza Mulholland, our Collaborator/Music Director/Sound Designer. Where would we be without their amazing talents? Not forgetting the talents of musician Alasdair Taylor whose mandolin playing features alongside Liza’s piano and accordion playing, as well as singing, in Chapters 1 to 3, all recorded and mixed by Stephen Bull in his recording studio, not far from us – more behind-the-scenes, free-to-view, Bonus Features will be coming soon showing everyone's work as it developed. Meanwhile, you can see a 'wee' snippet of Alasdair in this trailer for our recently released Chapter 5 set of Story Vignette videos. We thank them one and all and are so looking forward to working with them again on Chapters 4 through to 9. As we are looking forward to commissioning more work from Textile Artist, Ruth Black, who is hard at work on other items for the Elphen collection. And there is one more person who is busily working away in her creative studio on another collection of unique Elphen Artefacts, whose work we look forward to revealing in the months ahead. NOTE : This Newsletter contains information pertaining to Paul W. Taggart and Eileen M. Tunnell and may contain copyrighted material, as such it is protected by International Copyright law and DMCA.